I never seem to get it right on the first stroke. That’s why I use pencil and make my initial movements lightly. I saw some simple line portraits the other day that were bold, direct contours of faces. I tried that today during my 15 minute sketch time. I wonder if the bold lines in those portraits that inspired me were spontaneous or carefully crafted and inked over light pencil scaffolding. 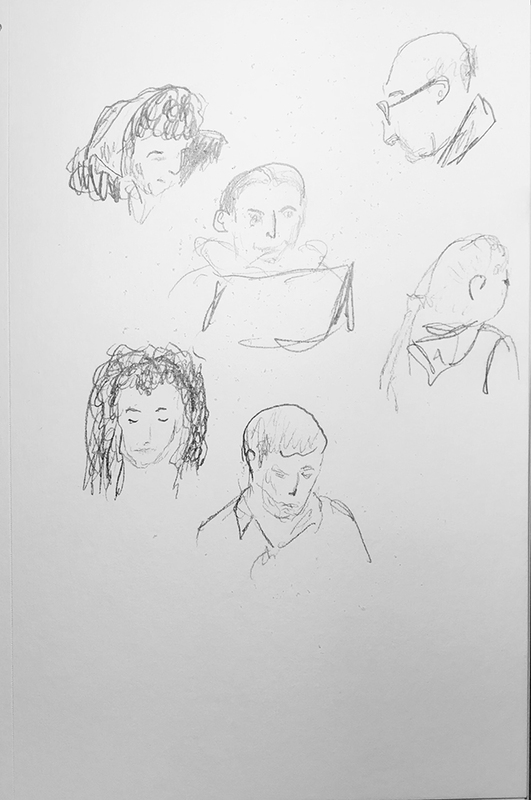 This entry was posted in Personal Stories and tagged 15 minute sketch, artistic process, bold lines, creative process, creativity, drawing, faces, imagination, portraits, sketching. Bookmark the permalink. I have the same situation, false starts, but I don’t want to redraw ( or re anything else if I’m telling the whole story!) and I’ve really been liking blind contour drawing for fresh lines and confident pictures- imperfections and all. Has taken me time to get to this. I like your drawing style and enjoy your exploration of finding and refining your vision. Thanks, Claudia. Blind contour drawing! How brave. My contours usually end up more like spirals.